In the 17th century, in the countries of Europe it was extremely popular to take action on which many prominent physicians, surgeons, and even ordinary citizens gathered; this was the public opening and anatomical study of a human corpse. It is this moment that the great Rembrandt depicted in his picture. The artist finds scientists studying the hands of a corpse attentively, which lies on an anatomical table, and around it are interested medical faces. The picture, created in 1632, was written with the doctor of anatomy Nicholas Tulp and his colleagues. Famous names and other characters in the picture: Andrian Slabran, Jacob de Witt, Jacob Colevelt, Matthys Calkun, Frans van Lunen, Jacob Block and Harman Harmans. The name of the troupe is Adrian Adrians, while he was a thief and robber, he was sentenced to death by hanging. 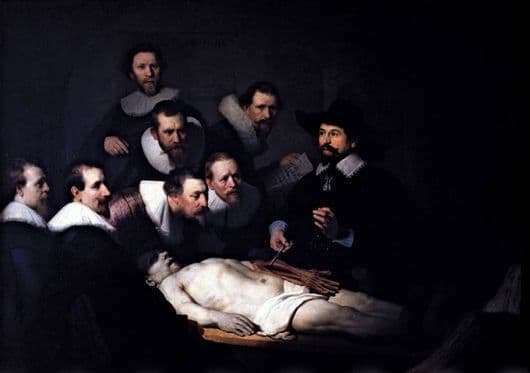 The procedure described on the canvas has the scientific name of an autopsy, a similar autopsy was performed once a year by the Amsterdam surgeons’ guild, all who wished were present as spectators, elders of the guild specially invited artists to capture their skills. Rembrandt devoted a lot of time to drawing the details of the troupe, trying to show the inexhaustible scientific interest that doctors and surgeons had to study the internal structure of man. The troupe is illuminated, so that all the smallest details are drawn, especially an anatomized hand, over which Tulp himself bends. Currently, it is found out that some of the details of the painting were painted by the artist after the completion of the canvas. Such details, for example, are the hand itself, in place of which there was a chunk of the brush, since the thieves themselves had to cut off the hand before execution, as well as the finished character, which was not originally in the picture. The canvas is made with dark colors, however, the faces and silhouettes of those present are clearly visible, as well as the facial expressions of all who take part in the action.